Certainly one of the most famous Americans of his time. 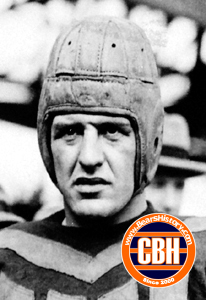 Re-wrote college football record books as a running back at the University of Illinois, George Halas signed Grange to play for the Chicago Bears at the end of the 1925 season in a secret deal with Grange's agent CC (Cash & Carry) Pyle. Grange and the Bears embarked upon a 16-game "Barnstorming Tour" around the country to showcase the game of pro football in its 6th season, and America bought what Halas and Grange were selling. Pyle and Grange would only agree to continue playing for the Bears in 1926 if Halas offered a piece of the team, which he would not. Grange played 1926-27 for the New York Yankees of a competing football league, then injured his knee in a game against the Bears in Wrigley Field, and missed the 1928 season. Came back to play for the Bears from 1929-1934, also playing defensive back. Nicknamed "the Galloping Ghost" and the "Wheaton Iceman" (raised in Wheaton, IL). Charter Member (1963) of Pro Football Hall of Fame. Died in 1991 at the age of 87.